ZurumNewsdigest. : New Economic Development For Nigeria: Decentralisation not the next elections. New Economic Development For Nigeria: Decentralisation not the next elections. Nigeria's federal system of government needs urgent reforms to reflect our current problems and update our institutions to work for everyone for good. Now is the time. Everyone recognises that including the current president and the APC manifesto that helped his presidency. Sadly the country is trapped in a 'mental frame' that it must be bussiness as usual. The federal power kills development and creates violence; a group of individuals simply want to be in control of the nation's resources with violence, not caring about the cost and devastation. What ordinary people need is jobs. Federal power creates jobs for their families, friends and associates, sycophancy and unnecessary competition at the centre. Federal power kills the power of regions/independent states to develop, build basic infrastructure for economic activities including Airports, Seaports, well-funded education and Research institutions, good healthcare and greater public infrastructural investment, the key foundations for jobs and growth. 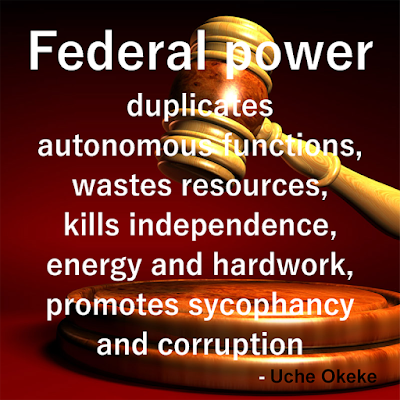 Federal power denies ordinary people good governance by influencing election outcomes thereby imposing unqualified candidates to do their bidding at the local level. People need jobs for survival, new skills, increase wages, plan their future and contribute to the economy and society. Regional autonomy will help drive development by moving power down to identity and creating motivated teams of people with a clear mandate to deliver, expand the tax system and greater local economic development. I don't know how many jobs Buhari's government has created or intend to create in this his four years mandate, but all their families and friends are gainfully employed in some of the best institutions. The local government is non-existent. The politicians simply appoint care-takers to collect monthly allocation meant for rural development because of federal power. This will not happen if the regions or states are autonomous. Regional autonomy/ restructuring should be the priority of the government not 2019 elections. All these manipulations happen because 'we haven't got an adequate body of informed citizens'. All we have is sycophants who go to postrate to those in power and sing praises to survive. According to Professor, Sir Paul Collier:"The world is trapped in a situation where we haven't got adequate rules, adequate international institutions. And there is little pressure for that. Because we haven't got adequate body of informed citizens around the world, people who understand the problems and are willing to put some pressure on politicians to do something about it. In it's small way, this course is an attempt to help build an informed international citizenry". He concluded : "You can do something about that by encouraging other people to get informed". Nigeria needs a new society on a shared struggle and shared identity to lift it's people out of poverty. Regional Autonomy/ Decentralisation is inevitable.